Stock markets holidays are something that investors must definitely knowledgeable about. otherwise, it will turn out as a huge disappointment if you ready yourself, heading towards investment in stock market investment. Thus, well informed regarding stock market holidays is pertinent! If you are looking out for regarding stock market holidays schedule or how do I keep track of all the stock market holidays in India, then I must say you are landed at the right place. 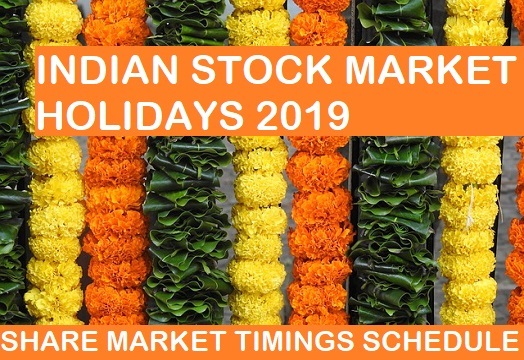 Our today’s post is all about stock market Indian holidays 2019. so, readers, stay tuned with us till the end to learn more about stock market holidays schedule 2019. Investors it is to inform you that the indices of the stock market recently released their schedule of holidays for the year 2019. If you are a beginner investor and looking for how to invest in the share market? then you must also be aware regarding stock market holidays. Weekends ie Saturday and Sunday is always close to the stock market both exchanges (NSE & BSE). yes, the exchange remains closed for the weekends it is utmost significant for those who are willing to trade. The business timings for the stock market remain as the opening time of 9:15 am IST and closing at 3:30 PM IST. Below listed are the holidays for the stock market for the year 2019, let’s take a look at the following. the list for holidays include the national holidays and the regional public holidays. How to Make Money in Share Market? Morning trading shall take place between 10:00 a.m. and 05:00 p.m.
Evening trading shall take place between 05:00 p.m. and 11:30 p.m.
During the normal days, the stock market works in 3 separate sessions as discussed below. It is used for the smooth translation of the pre-opening session to the normal session. The indices provide the 15-minute session to the trader so, that if required they can modify their orders before the actual market proceeds fo the day. The window remains open from 9 am to 9: 15 am every trading day. at the same time, basic checks are completed at operational as well as the technical level by the indices going ahead with the business session. For the traders, who want to trade on specific indices, the stock market is operational between 9:15 am to 3:30 PM on any business day. at the same time if you buy a specific set of stocks on day-1 you may choose to exit the same day ( Intraday trading) or any other day as per your preferences. The timings of the Post-closing session is between 3:40 PM to 4:00 PM. You can place your orders to buy or sell stocks in the post-closing session at the closing price. If buyers/sellers are available then your trade will be confirmed at the closing price. NOTE: Pre-opening session and the Post-closing session is only for the cash market. There are no such sessions that are available for future & options. The session remains open for twenty minutes & the timing for the same is between 3:40 to 4 PM. Last week, in a circular no: MCX/TRD/537/2018, it was announced that trading hours for commodity derivatives segment in Indian commodity market will be changed from December 31, 2018. Note: – The Muhurat Trading Timing for 2019 shall be notified by the Exchange subsequently. No trading in all other Agri commodities on such days. I am much delighted to share my knowledge about “Stock market holidays 2019″ & “Share Market timings“ with you all. I hope you find a piece of information useful and great assistance. Please, like and subscribe us if you love reading us. Also, write to us, if in case you encounter any issue with the post. You can reach us through the comment section below. Regards and good look for future success.